Viewer File Type plug-in allows to create standalone executable files (*.exe) from your worksheets. 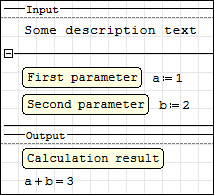 SMath Viewer is an alternative GUI for SMath Studio. So SMath Studio is an editor for worksheets and SMath Viewer is a reader. 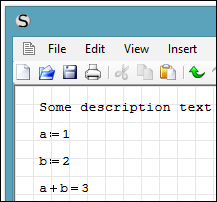 Open SMath Studio 0.96; create some variables, formulas and text in the worksheet and then open the Save File dialog (File > Save as). 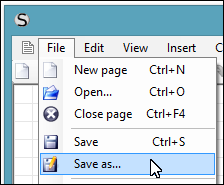 Choose Executable files (*.exe) from the drop-down list under the File name input field and press the Save button. 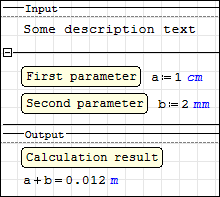 Some regions (such as Math Region or Plot) in SMath Studio has a Description feature; use it to set description for the items. Use expanded Area region to group items on the output form (nested Areas supported) or collapsed Area regions to hide regions you don't want to be a part of user interface. Use Separator region to separate your worksheet on several tabs (to set title for the first tab just put Separator before all other regions). Fill in fields in Properties dialog (File > Properties) to set output window title, program's description, author etc. This is very important to make a solid final product. 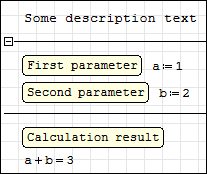 Use units in your worksheet (nice units selectors will be automatically shown in output application). Use multiple languages in your worksheet. 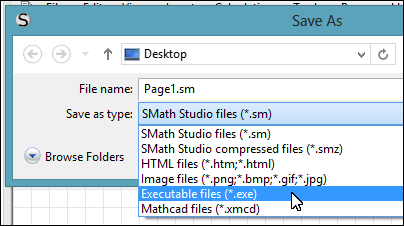 SMath 0.96.4868: ViewerFileType built-in plugin added.